I’ve written before about how Paul’s seemingly misogynistic passages were a real stumbling block to me at one time. In that post I mentioned that although Peter said some of the same things Paul said, he never bothered me quite the same way. Whether that’s because I already liked Peter, who kept me laughing with all his mouth-moving-before-mind antics, or because he didn’t write half the New Testament, so that his words didn’t carry the same metaphorical weight, I’m not sure. I only know I should probably have dealt with his household codes before now. So I’m here today to offer you the latest in these apostolic adventures of mine. Another thing Peter did? He took care of his mother-in-law, something I never questioned but that Card claimed wasn’t Peter’s cultural responsibility – it would have been his wife’s brothers’ responsibility. So it seems Peter valued his wife, and he valued his mother-in-law, and maybe just maybe he wasn’t as anti-woman as I’d always thought, either. In the same way, you wives must accept the authority of your husbands. Then, even if some refuse to obey the Good News, your godly lives will speak to them without any words. They will be won over by observing your pure and reverent lives. Don’t be concerned about the outward beauty of fancy hairstyles, expensive jewelry, or beautiful clothes. You should clothe yourselves instead with the beauty that comes from within, the unfading beauty of a gentle and quiet spirit, which is so precious to God. This is how the holy women of old made themselves beautiful. They put their trust in God and accepted the authority of their husbands. For instance, Sarah obeyed her husband, Abraham, and called him her master. You are her daughters when you do what is right without fear of what your husbands might do. Oh I knew that verse 7 existed, but maybe only in the New International or King James Versions, which are much more patronizing. And this Bible verse, this amazing, freeing, validating, liberating Bible verse, it was neither underlined nor starred in my Bible. WHY EVER NOT?!?! This is a Bible I’ve used for six years. Six years of reading the previous verses and feeling the weight of their burden, but never noticing verse 7 just below them? These words are such a balm for my soul. Right there in verse 7 Peter calls me, as a wife, an equal partner. An equal partner. And this particular version tells husbands that they MUST give honor to their wives. Must?? That’s a much more commanding tone than NIV or KJV. So I did what I usually do when a verse strikes my fancy: I looked up the Greek words on Bible Hub. Basically, Peter is instructing husbands to assign appropriate honor and respect (there it is again, a woman’s heart-need for respect) to their wives, because they are valuable and worthy, and to live with their wives in a wise and understanding way (“It’s not about the nail” comes to mind), because she is a joint heir, co-inheritor, and equal partner in Christ. And why should they do this? So the work of God won’t be blocked or shortchanged in their lives. The same goes for you husbands: Be good husbands to your wives. Honor them, delight in them. As women they lack some of your advantages. But in the new life of God’s grace, you’re equals. Treat your wives, then, as equals so your prayers don’t run aground. But even if you stick with a strict translation and some Greek background, you will not get the same thing out of Peter that I have been getting for years (on the surface): a man at the top calling all the shots. Instead you will get: EQUAL PARTNER. A wife is her husband’s equal partner. It brings me to my knees in thanksgiving to have a Lord whose gospel of life reframes everything human beings tried to twist His perfect Edenic world into. So I’m now laying to rest my last reservation with Peter. Peter and I can now be completely at peace. And I can now rejoice that Peter — and God — calls me my husband’s equal partner. I also consider, “Husbands, love your wives as Christ loved the Church and gave Himself up for her”. Love is not love without someone giving up themselves. That is, my agenda takes a back seat when I consider my wife. If I am to love my wife, I must give up myself…put me aside. Jesus put Himself aside, leaving glory and coming to serve Mankind. There are misguided teachings out there, concerning men and women. The Church has made a doctrine out of something that the scriptures really did not. 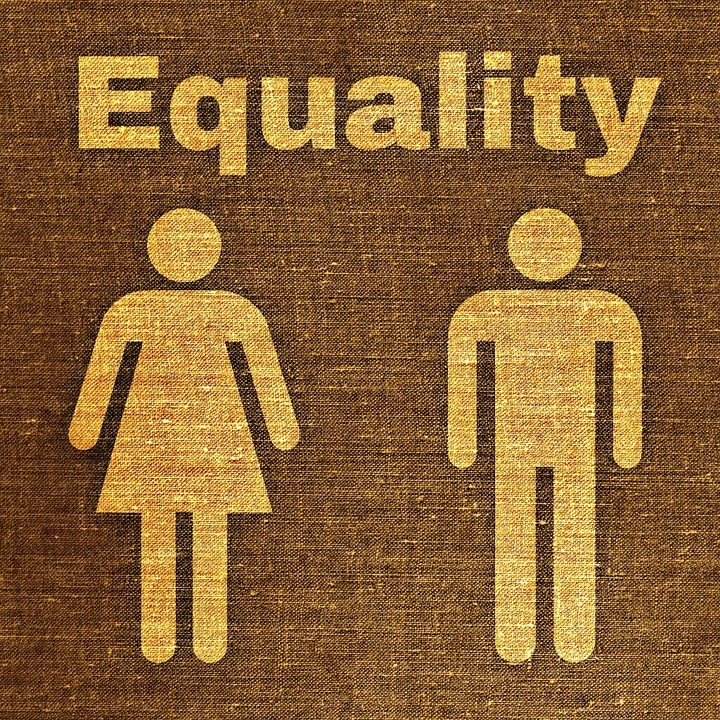 See my post series, Equality or Equity. Had a little help from a friend (one or two are a tad wordy, sorry). I had to dig in and see what the real view of women is supposed to be. So true. A lot of the controversy is taken care of by the companion commands for husbands to truly love their wives. That message often gets lost along the way . . .
Men like to exalt, “wives, respect your husbands” and make it into some sort of subservient idea. This goes contrary to God’s creation of ezer kenegdo (look it up, if you are not familiar with it…some good teachings on it). I’ve learned 3 truths that have helped me make peace with and better understand 1 Pe 3:7. I would like to share them with you (albeit not all at once) because I really believe these 3 truths will bless you. While Peter – a God-inspired writer – instructed husbands to dwell with their wives in understanding, Solomon – another God-inspired author and collector of Proverbs – described how a man of understanding will and should behave. Wow! The implications of the Proverbs that describe a man of understanding coupled with 1 Peter 3:7 are absolutely groundbreaking and awe-inspiring. – be able to draw out counsel from her when he needs it. After reading those Proverbs describing a man of understanding, I realized that Peter’s instruction to husbands to dwell with their wives in understanding is not something to be taken lightly, and husbands need to get and cultivate wisdom in order to accomplish that task. Thanks for your thoughts here, K. Martin!